The story goes that Audio-Technica introduced the AT4040 as a replacement for the AT4033. 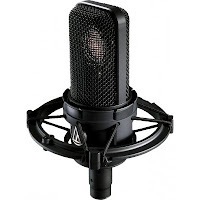 Audio-Technica saved design costs by putting the AT4040 in the same microphone body as the AT4033. While Audio-Technica wanted the AT4040 to replace the AT4033, its dealers asked Audio-Technica to bring the AT4033 back to market. The AT4040 sounds different than the AT4033. All comparisons end at the mic body and with Audio-Technica's former wish that it replace the AT4033 in 40 series line up. In the time I've been using the Audio-Technica AT4040, I've come to think of it as the entry-level side-address large-diaphragm condenser microphone that surpasses for the money anything made by the competition. I remember when I bought my first large-diaphragm condenser microphone. I read online about a budget microphone that rivaled a Neumann. They say that a sucker is born every minute and I was that sucker. When my budget large-diaphragm condenser microphone arrived, I did not like it that much. I found it sort of shrill. Still, I knew the online gods could not be wrong. I knew they would not mislead me. I worked that microphone over. Eventually, I did find that it would suffice for lots of male vocals. In time I got in the Audio-Technica AT4040 and added it to the cabinet. As my microphone collection grew, I found myself liking my first large-diaphragm condenser microphone less and less and liking the AT4040 more and more. As new microphones come in, I continually cycle through and comparison test all my microphones. In this process I found my old microphone usually sounded good up against bad mics. Yet, it never really sounded good when compared to a quality microphone. Eventually, I put it on eBay. On the other hand, the AT4040 showed itself time and time again as a quality mic throughout these comparisons. Quality does come at a price, albeit a small one. The AT4040 streets for about $70 more than my first large-diaphragm condenser. At $299, the AT4040 gives the project studio enthusiast a quality large-diaphragm condenser microphone upon which to build a solid microphone collection. What do you get for $299? You get the microphone, a shockmount, a dust cover, and a case. I wish that Audio-Technica would make their cases so that the shockmount could go inside. Some people sort of complaining about the rubber band shockmounts used by Audio-Technica. Some people saying it's a tad bit of a struggle to get a mic in and out of one of these amounts. They do isolate well. I've yet to see one break unlike other designs. The dust cover is for when you leave a mic up on its stand. I like the look of the dust cover with its black velvet the fabric and embroidered Audio-Technica logo. The AT4040 is a true condenser, externally polarized, requiring 48 volts of phantom power. It's a transformerless design featuring a cardioid pattern. Designers say a transformerless design provides improved transient response. Detractors say transformerless designs can sound sterile but I did not find that the case with the AT4040. The mic features a switchable high pass filter and a 10 dB pad. The plot provided by Audio-Technica shows a frequency peak of about 5 dB at 7 kHz and about 2 to 3 dB at 11 kHz. How does this sound? Despite the frequency peaks, the mic tends to fall into the neutral camp, albeit the brighter portion of it. I never found the microphone to be brittle or shrill. I consider this one of the most versatile microphones that I've ever used. It generally sounds good on most any instrument application. I particularly like the microphone on acoustic guitar. I know of some pro engineers who like using this microphone over a drum kit in singles or pairs. The AT4040 tends to be a good choice for many voices. I do not recall recording any dialog or vocals where it never worked. I did find better microphones on occasion. It did get a bit too lispy with people with essy voices where their problem frequencies matched up with the AT4040's frequency peaks. I generally found myself using the mic with the high-pass filter engaged to avoid low frequency muddiness. I liked the AT4040 on cleaner guitar amp sounds. I did not like it on overdriven sounds as I did find it too harsh for my tastes as I generally prefer ribbon microphones and dynamics for this application. The Bottom Line: In a world where budget recordists want a "bang for the buck" I suggest saving up a few dollars more to get this quality mic as the foundation of a superior mic collection. Highly recommended.